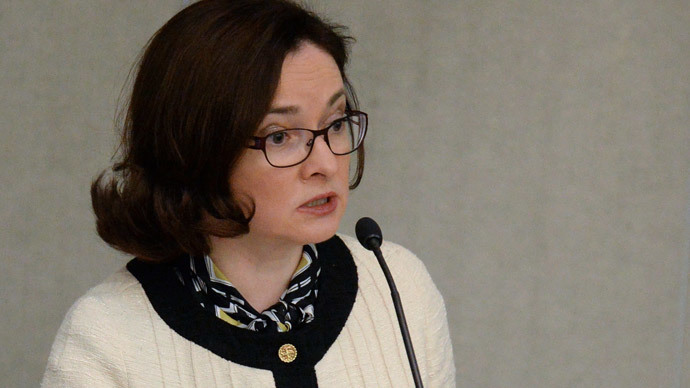 Russia’s Central Bank is unlikely do a u-turn on cutting key interest rate as inflation is expected to subside to 4 percent mid-term, said the bank’s head Elvira Nabiullina. The bank will decide on future rate changes based on an analysis of the economy, and the forecast on the dynamics of inflation and risks to growth and financial stability, Nabiullina said in an interview with Bloomberg Monday, adding that all the moves will be aimed at targeting inflation. At the same time Nabiullina admits that low oil prices and sanctions will lead to an economic contraction and expects it to be at around 3 to 4 percent in 2015. In an attempt to revive economic growth, the Central Bank unexpectedly cut its key rate to 15 percent from 17 percent at the end of January. This caused fears it could further trigger inflation that now stands at 15 percent. It’s expected that economic contraction will affect the banking system, as banks will offer fewer loans and lending rates will be higher. “However, there’s no systemic problem – stress tests show banks will get through in a stable condition,” said Nabiullina. Talking about possible measures the Central Bank could take to curb the economic downturn, she said it would never use such tools as pumping money into the economy, fixing the exchange rate, or imposing administrative restrictions on capital flows, as it is fundamentally unproductive. Recalling December 16, which has become known as Russia’s ‘Black Tuesday’, when the ruble reached unprecedented historic lows, Nabiullina said it was a crucial date, as on that day the CBR stepped away from the currency market letting the ruble float freely. The only case in which the CBR could intervene in the Russian currency market is if there is a direct threat to financial stability, she said. Meanwhile Russia has increased its gold holdings to 39 million ounces which makes up nearly 12 percent of the country’s reserves. The move was made to diversify foreign currency and gold reserves and solve the problem of ruble liquidity, she said. The Central Bank of Russia bought a record amount of gold in 2014, spending $6.1 billion in an attempt to reduce dependence on the dollar.